Filled with vegetables, served with house special sauce. Delicate natural crabmeat mixed with cream cheese, minced onions, wrapped in a spicy egg roll skin. Unleavened bread with flecks of scallion, served with ginger sauce. Deep-fried shrimp in light breading. A must try! Lightly breaded and stir-fried with fried garlic, fresh peppers, salt and pepper flavor. Lightly breaded and stir-fried with fried garlic, fresh peppers, salt and pepper flavor. Broiled Japanese green soy beans. Meat vegetable dumplings served steamed or pan fried. Vegetable dumplings served steamed or pan fried. Grilled and lightly salted yellowtail served with ponzu sauce. Yellowtail served with hot yuzi sauce. Select crabmeat and avocado with avocado sauce. Crabmeat, avocado, tobiko and thin slices cucumber wrap. Tuna, salmon, yellowtail and avocado roll. Seared sliced tuna in lemon ponzu sauce. 3 pieces of tuna, 3 pieces of salmon and 3 pieces of white fish. Yellowtail, tuna, avocado, tobiko, scallion & ginger with spicy mayo and avocado. With scallops, beef, crabmeat, shrimp and vegetables. Basic salad with red wine vinaigrette or ginger dressing. Tomato, cucumber, onion, mixed green and lettuce with Persian dressing made with olive oil, fresh lemon juice, crushed garlic and salt and black pepper. Marinated grilled shrimp, mixed green salad in our house special vinaigrette dressing. Seaweed, bean sprouts and mixed green salad with Japanese seven flavor spices and house ginger dressing. Tako, crab meat, and shrimp with special sauce. The most famous Chinese dish. Lightly breaded fried chicken with spices, minced garlic and cooked in spicy sauce. The most famous Chinese dish. Lightly breaded fried shrimp with spices, minced garlic and cooked in spicy sauce. Crispy chicken cooked in chef's special hot sauce flavored with orange peel. Beef cooked in chef's special hot sauce flavored with orange peel. Crispy duck cooked in chef's special hot sauce flavored with orange peel. Jumbo shrimp lightly breaded and stir-fried with ground black pepper mixed with scallions, garlic and served on a bed of steamed broccoli. Calamari lightly breaded and stir-fried with ground black pepper mixed with scallions, garlic and served on a bed of steamed broccoli. Lightly-breaded tender chicken breast topped with house special lemon flavored sauce. Lightly-breaded tender shrimp topped with house special lemon flavored sauce. Sauteed in rich brown sauce. Sauteed with diced vegetables and roasted peanuts in spicy brown sauce. Sauteed in young tender pea pods in a light sauce. Chicken with tender vegetables and roasted cashew nuts in a mild sauce. Sliced tender lamb sauteed in a mild spicy Hunan sauce, served in a bed of steamed broccoli. Sliced lamb with onions, scallions, and assorted vegetables in a special sauce. Sauteed tender lamb with vegetables topped with mushroom sauce. Large cubes of tofu in Szechuan sauce. Fresh tofu with crispy selected vegetables in special brown sauce. Sauteed Chinese greens in garlic wine sauce. We waited for menus. We waited for waiter. We waited and waited and waited for appetizers. We asked why tables who entered after us got served as we waited. Appetizers tasted OK. Main courses tasted OK as well. Waited for check. Unimpressed with this establishment. Didn't feel like coojing si stopoed by this Asian restaurant to get take out to try. Sorry. Did not like abd win't bother going bsck. Didn't like the flavors or sauces. We had dinner here for my son's birthday. The food was amazing. The portion sizes are quite large. The service was also good. The food was great the place is clean and neat. They gave a very large portion of food. I was not impressed with the service but the food made up for it. Small local business with super tasty food. Mai tai's are the best and the sushi is always the freshest. Try the Kiss The Fire sushi roll you won't be disappointed. The menu is very limited. The pad thai was very strange, with onions and green and red peppers, swimming in sauce, and no peanuts. The chicken and peanut dish had cashew nuts instead. The lunch menu is reasonably priced and includes soup and an appetizer. A great little Asian Fusion restaurant. 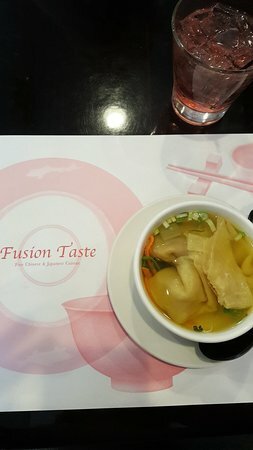 Get quick answers from Fusion Taste staff and past visitors.